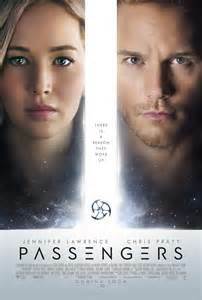 Passengers is a a classic case of a classic science fiction tale told in three acts. At its core is the basic moral question of where we draw the line between the rights of the individual against the rights of others. Specifically, in the case of Passengers, how far can an individual go when fending for oneself at the expense of others? That individual is Jim (Chris Pratt), an earthly passenger aboard a space ship taking him plus five thousand others to a new human colony. Through a malfunction, Jim finds himself awoken from hibernation and completely on his own 15 years from the start of the ship’s 120 year long journey; if all goes according to plan, everyone else is still asleep and won't wake till way past Jim's death of old age. On his own, Jim grapples with the dilemma of whether his solitude is worth addressing by messing about with the rest of the still hibernating folk around him. Specifically, Aurora (Jennifer Lawrence), with whom he falls in love. Clearly, one does not recruit Jennifer Lawrence for a role but then keep her asleep throughout the duration of the movie. Eventually, our Adam and Eve will be called to make personal sacrifices when the pendulum changes and the question is no longer how much should the many sacrifice for the individual but rather how much is it reasonable for the individual to give back to the many. Clearly, these are questions worth making a movie to promote a discussion on. Problem is, Passengers is an American movie, so things do gravitate towards the cheesy, the promised land at the end of the rainbow type conclusion. In order to get there, Passengers is not afraid to throw in physical impossibilities (despite taking much effort to present a very authentic space travel environment at first). Nor is it afraid to use the superior genes of its stars to titillate the viewer in quite unnecessary ways. Overall: It’s a shame Passengers’ commercial aspirations had to ruin the great foundations it had built. Then again, that is the story of Hollywood in a nutshell. 3 out of 5 crabs that could have easily been much, much more.